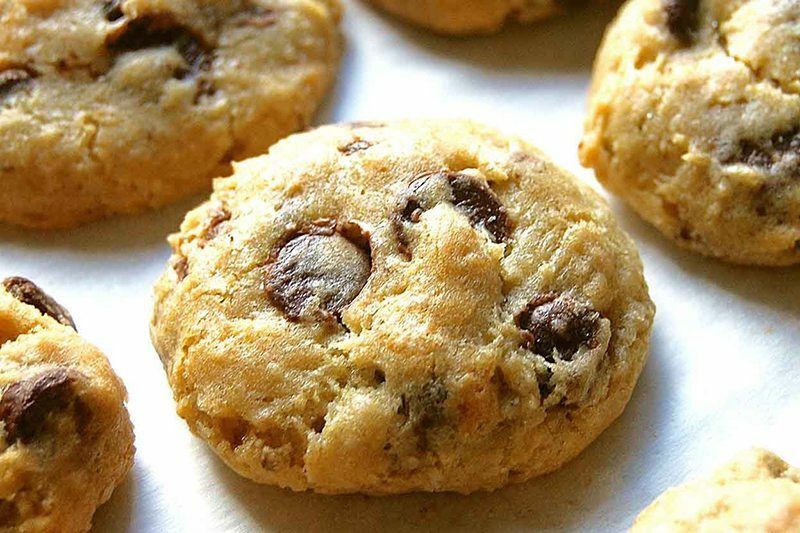 This conventional recipe makes use of the standard cookie ingredients in addition to white rice flour, potato starch, tapioca flour and xanthan gum. Although the soft and chewy results are good enough for wheat eaters to enjoy, that doesn’t actually mean you have to share. If you don’t want to mess with the hassle of creating a perfect gluten-free flour blend from scratch, you’re going to love this easy recipe. Simply pick up a pre-mixed rice flour blend from Betty Crocker and you’re all set to enjoy semi-homemade results. So you wouldn’t have to settle for cookies that are flat, sandy or greasy, America’s Test Kitchen went to work. 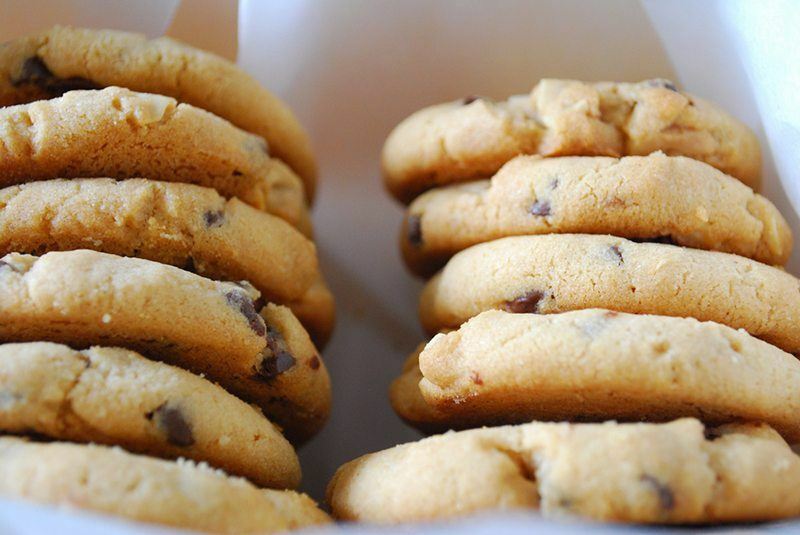 Through trial and error, the bakers found that cutting back on butter, adding more liquid and changing the brown to white sugar ratio flawlessly complements their flour blend–consisting of white rice flour, brown rice flour, potato starch, tapioca starch and dry milk powder–in a way that rivals wheat-filled cookies bite for bite. 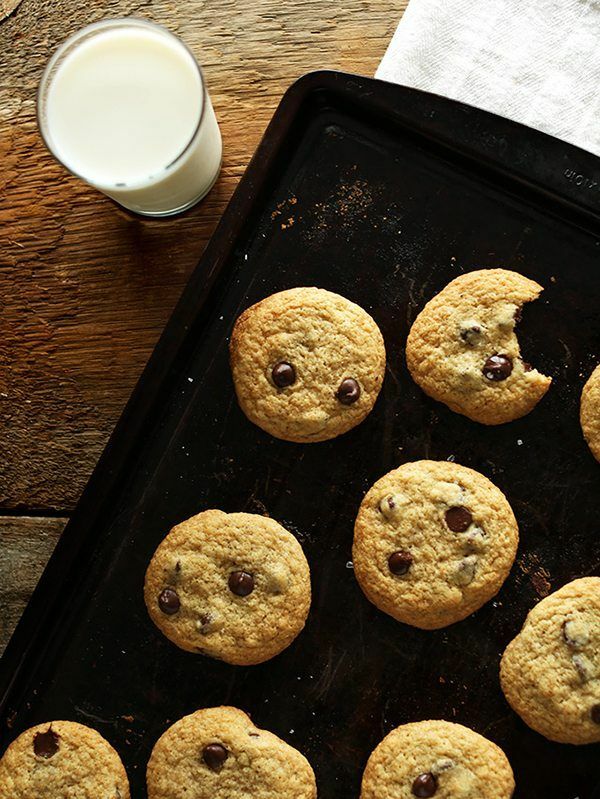 Made with brown rice flour and a little bit of cornstarch and tapioca flour, this carefully-crafted version of chocolate chip cookies is divine. Alton goes heavy on brown sugar and light on egg whites with a touch of whole milk so the chewy outcome will please even the toughest of critics. 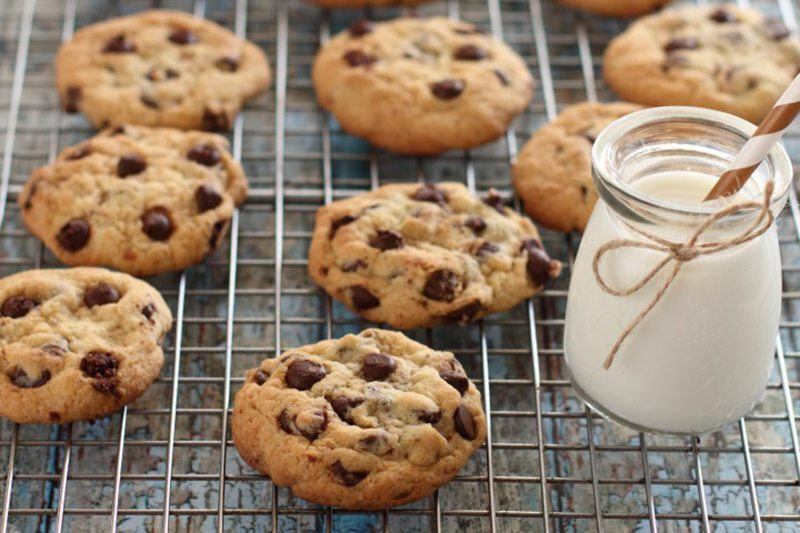 Using a homemade pancake mix featuring buckwheat flour, gluten-free oat flour, brown rice flour, white rice flour, yellow cornmeal and xanthan gum, you can easily whip up a batch of Dana’s soft and chewy chocolate chip cookies whenever you’re in the mood for a sweet treat. Just keep a container of pre-mixed flour in your pantry so you’re always good to go. 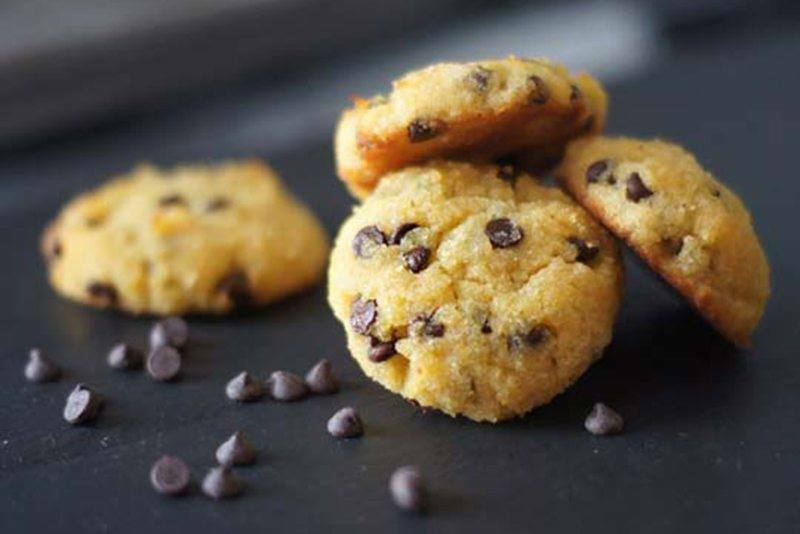 Calling for blanched almond flour, coconut oil, pure cane sugar and dark chocolate chips, this is a health-conscious recipe that packs a flavorful punch without subjecting you to grains, refined sugars or fake fats. Of course, we expect nothing less from the Wellness Mama herself. 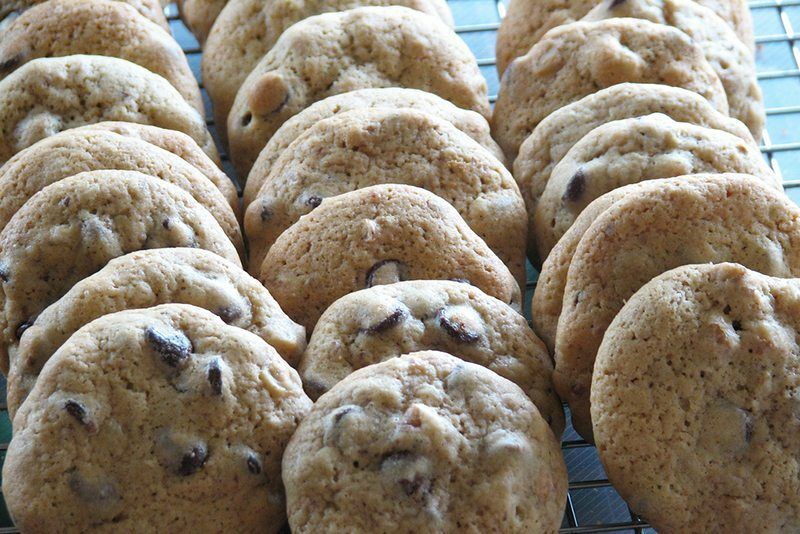 This seven-ingredient recipe is for a light and fluffy cookie that is sure to please your taste buds. Apparently, coconut flour, coconut oil, maple syrup, vanilla extract, salt, eggs and dark chocolate chips are all it takes to experience heaven on earth. Expensive flour blends and hard-to-find gums need not apply. 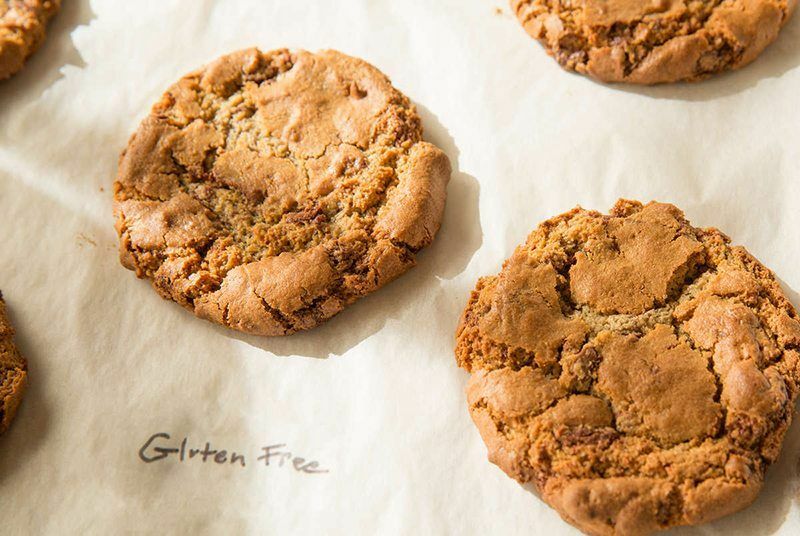 If you want a grain-free cookie that’s crispy on the outside and ooey-gooey in the middle, this recipe is for you. Quinoa flour provides the perfect base, dark brown sugar delivers a rich flavor and the extra egg yolk keeps the sweets extra moist. Don’t forget to sprinkle on a dab of course sea salt at the end. 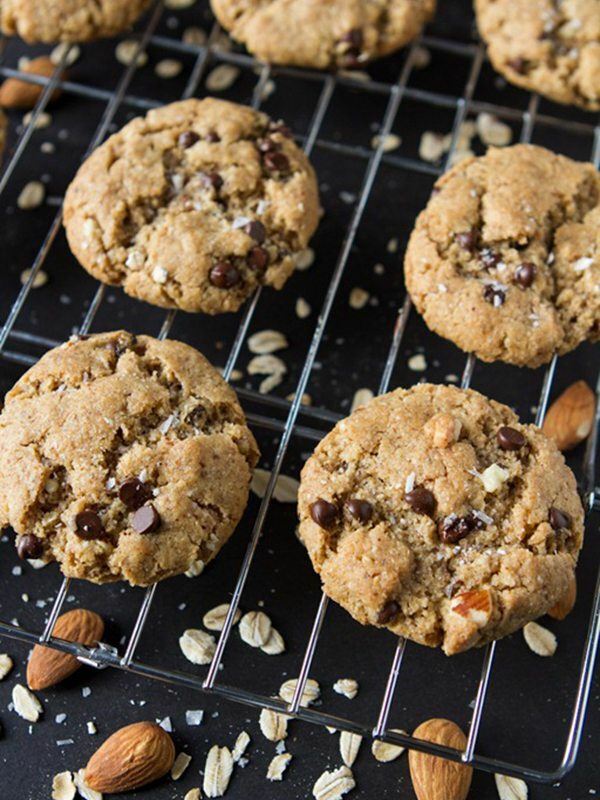 A blend of almond meal, coconut flour and ground flaxseed makes this gluten-free cookie insanely delicious despite being a paleo-friendly pick. If you’re strict with your diet, make sure to opt for coconut oil as your go-to fat and dairy-free chips as your source of chocolate. 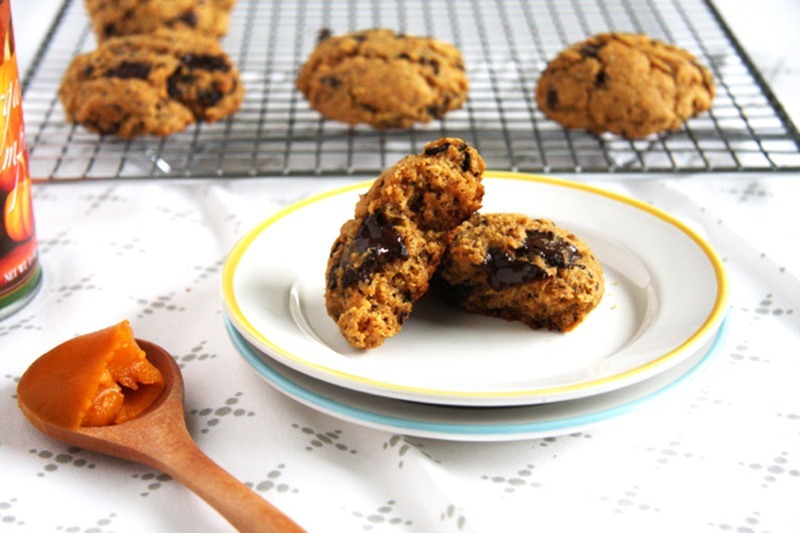 Featuring a homemade blend of glutinous rice flour, tapioca starch, cornstarch, sorghum flour, guar gum and gluten-free oats, these chocolate chip cookies are crisp yet tender. As Emma points out, if you prefer your baked goods on the crunchy side, you can easily achieve your desired results by increasing the baking time by a few minutes. In addition to dried cherries and dark chocolate chips, this recipe calls for gluten-free rolled oats and oat flour, giving you the ability to bypass the section at your local health-food store of funky flours. Simply use a food processor to grind your own oat flour and proudly present the tasty baked goods to a full house of dessert lovers. 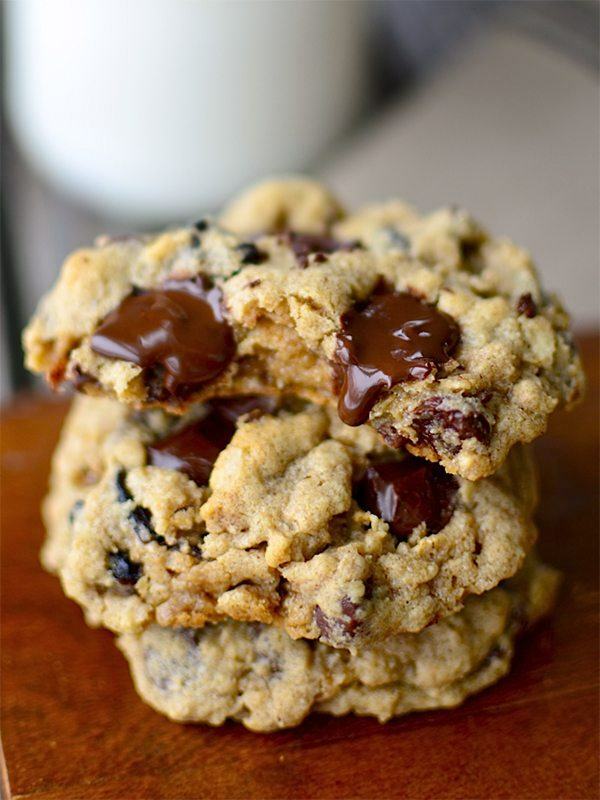 If you think having oatmeal and chocolate chips in the same cookie is getting the best of both worlds, you need to try this recipe. The gluten-free multi-purpose rice blend from King Arthur Flour incorporates white rice flour, brown rice flour, tapioca starch and potato starch to deliver a taste and texture that’s on point. As always, make sure your oats are certified gluten free so you don’t run into cross-contamination issues. The cream cheese in these oatmeal cookies by ChefSteps helps stabilize the gluten-free dough and adds a unique tartness to the sweet cookie for an irresistible combo of flavors. 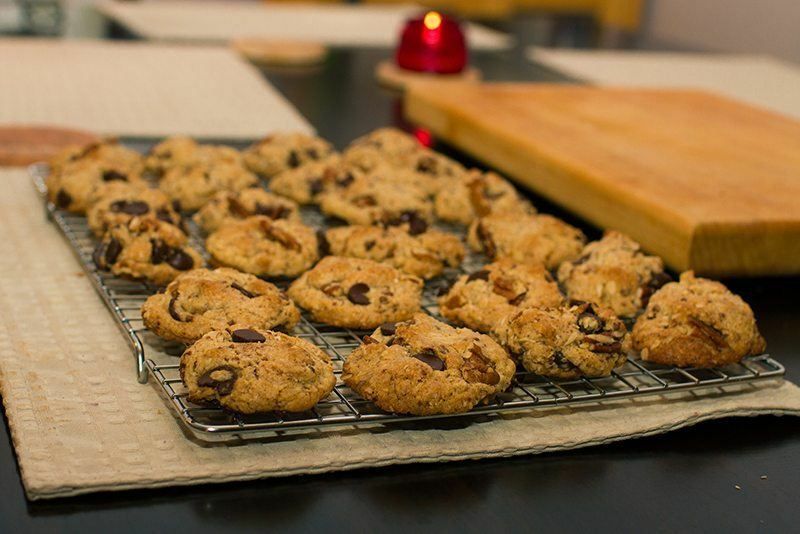 Use gluten-free rolled oats and oat flour to give your baked goods the structure they need. 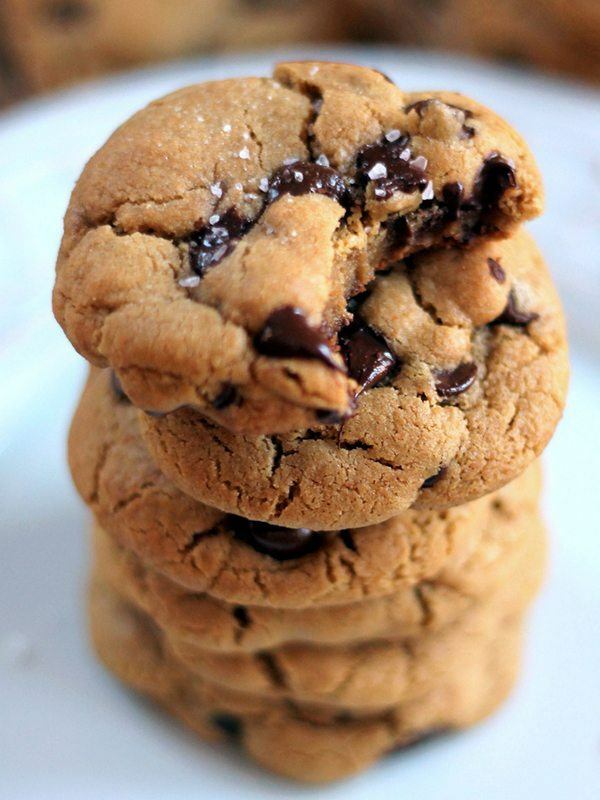 Made with creamy peanut butter, granulated sugar and semisweet chocolate chips, these no-flour cookies are surprisingly delicious. Once you mix in baking soda, salt and an egg, you get an amazing dough that produces puffy baked goods that are nothing short of masterpiece status. 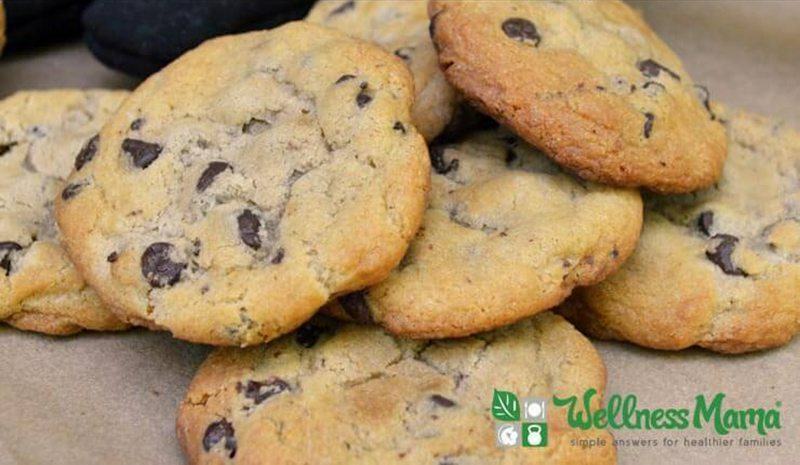 Just because you maintain a vegan lifestyle doesn’t mean you need to be missing out on the fun of warm cookies. 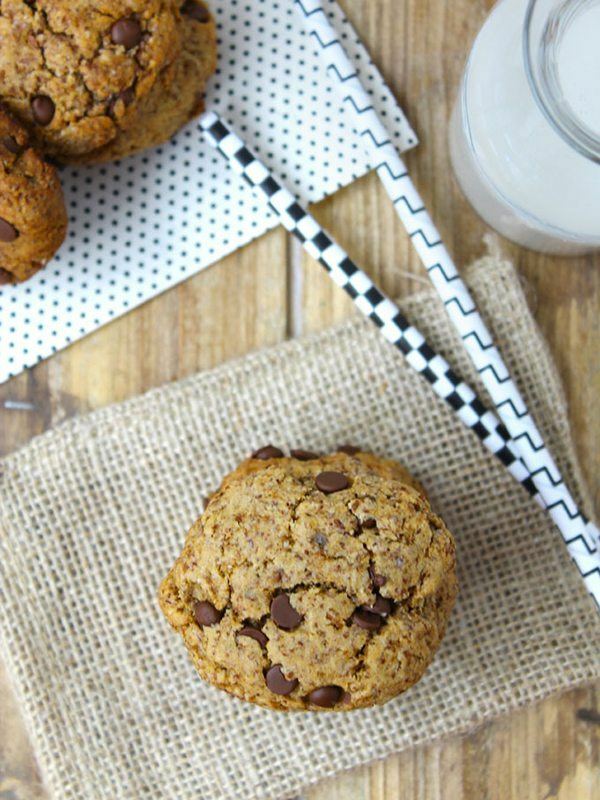 Recommending a non-dairy buttery spread and dairy-free chocolate chips, this recipe calls for gluten-free oat flour, ground flax, almond flour and natural peanut butter. 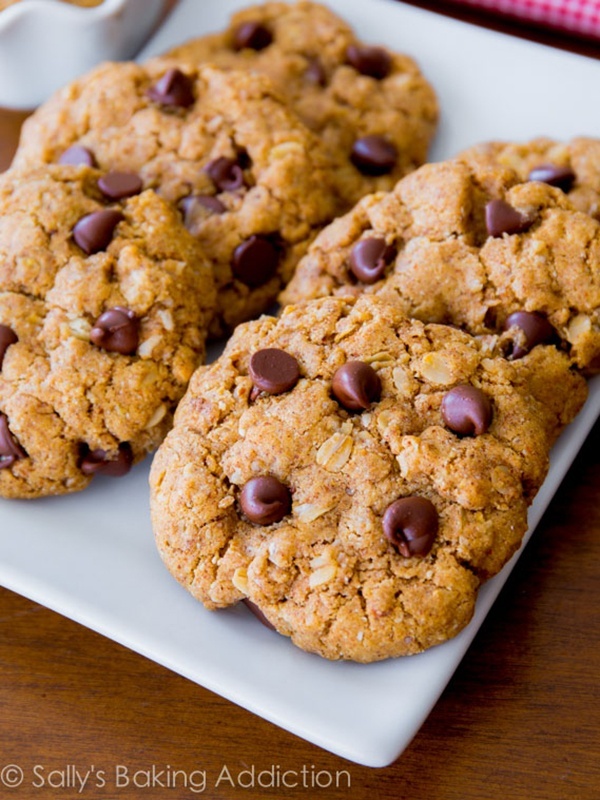 Flavored with peanut butter, cinnamon, light brown sugar, chocolate chips and gluten-free rolled oats, these flourless cookies are easy to make and hard to resist. To be on the safe side, you may want to plan on making a double batch from the get-go–the spiced treats really are that good. 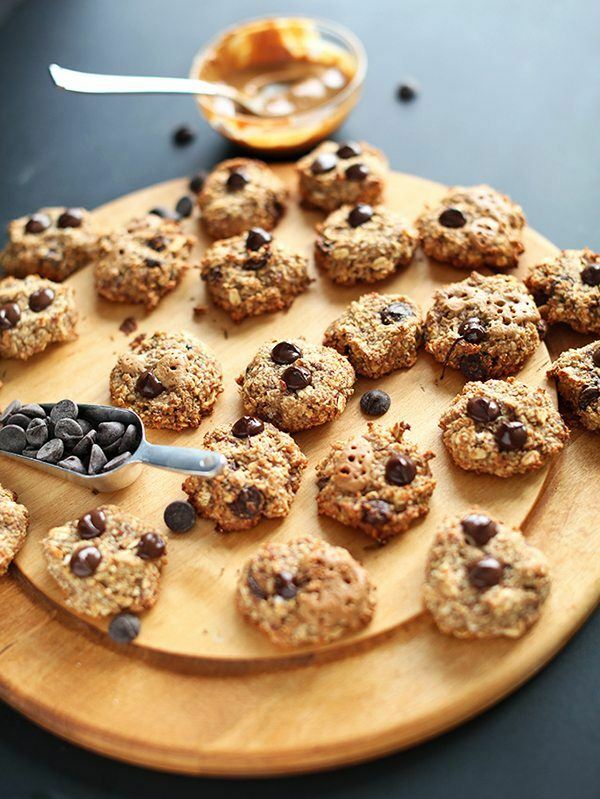 If you like your cookies to be healthy enough for a spot at the breakfast table while still being tasty enough for a place on the dessert tray, this recipe is a winner. Combine peanut butter, dates and a banana along with almond meal, gluten-free rolled oats, peanut butter chips and chocolate chips. 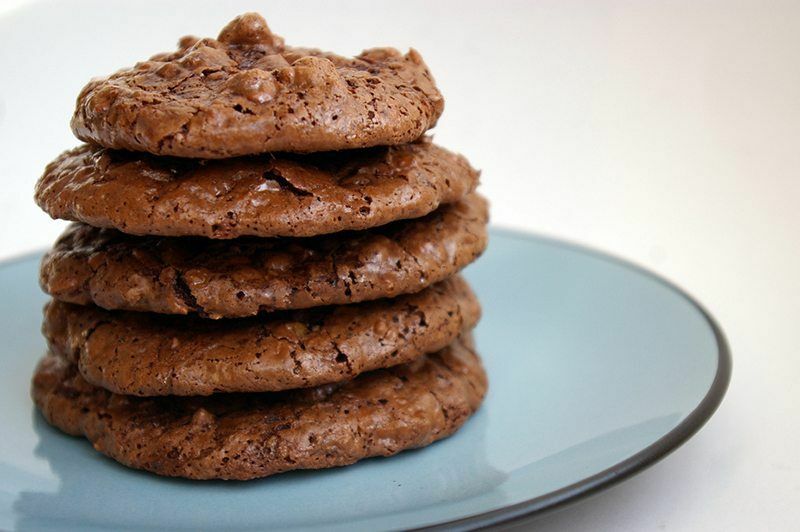 A combination of buckwheat flour, sorghum flour, brown rice flour and tapioca starch gives this cocoa-filled chocolate chip cookie a fantastic structure. With crunchy edges, a soft inside and the taste of a brownie, what more can you ask for? 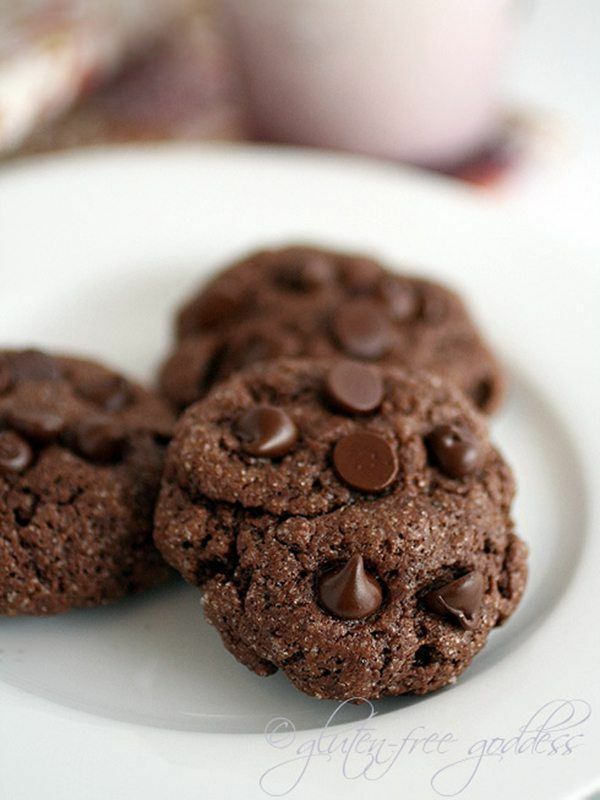 For these double chocolate cookies, you’ll make use of cocoa powder and the chips of your choice (we recommend going dark) in addition to coconut flour, almond butter and honey. The chewy and sweet results are satisfying yet nutrient dense for a guilt-free experience. 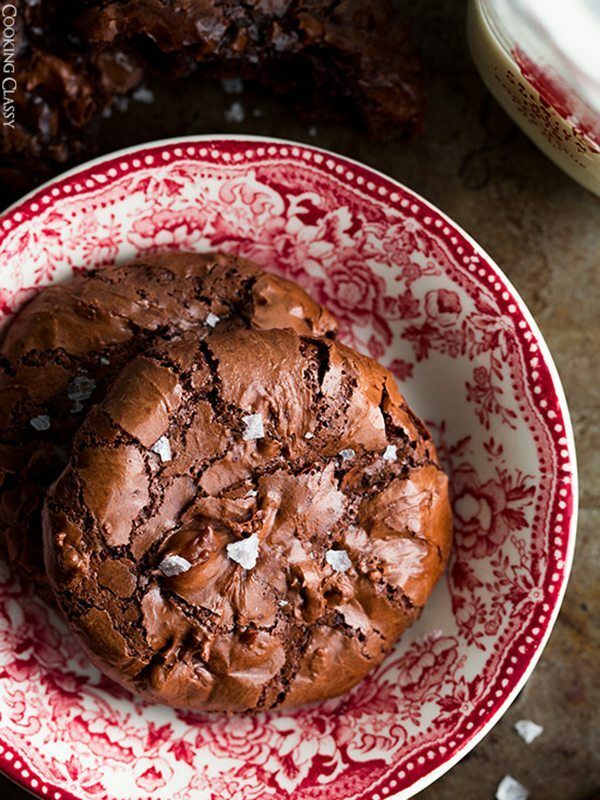 Espousing soft centers, crisp edges and a chewy texture, it’s hard to believe this brownie-like cookie is truly free of flour. The magical set of ingredients includes powdered sugar, cornstarch, and egg whites in addition to cocoa powder and chocolate chips. 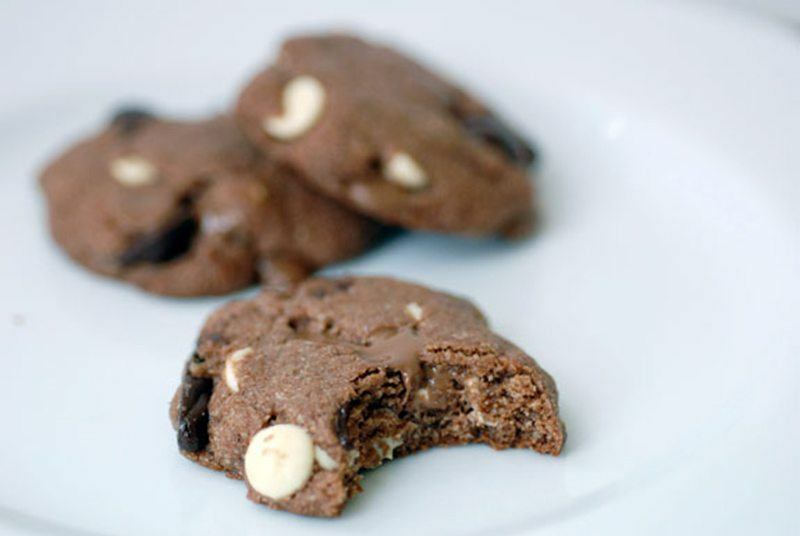 For a really special occasion, whip up a batch of these triple chocolate cookies featuring dark, milk and white chocolate chips. The dough’s base comes from blanched almond flour and unsweetened cacao powder, which enhance the decadent dessert in all the right ways. 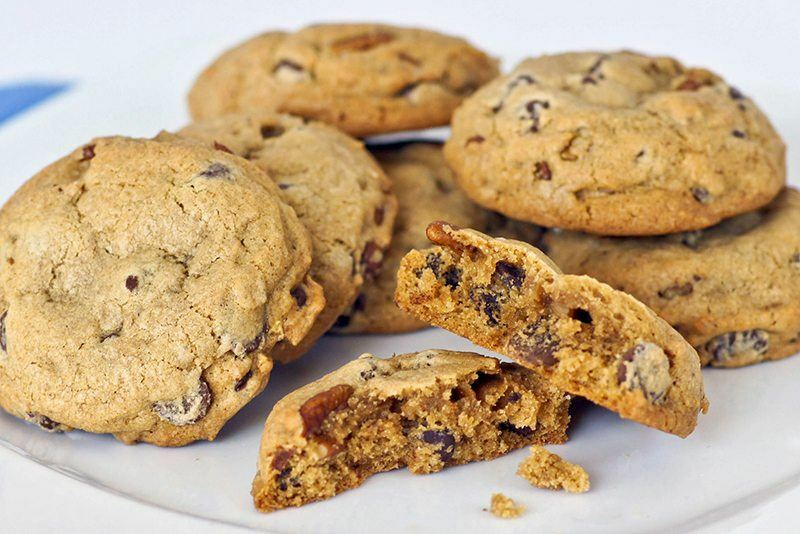 While making use of your favorite gluten-free flour blend such as Pamela’s Baking and Pancake Mix, you can revolutionize a standard chocolate chip cookie by adding pumpkin puree and pumpkin pie spice. The autumn-inspired outcome is festive enough for Thanksgiving consumption but tasty enough to serve year round. 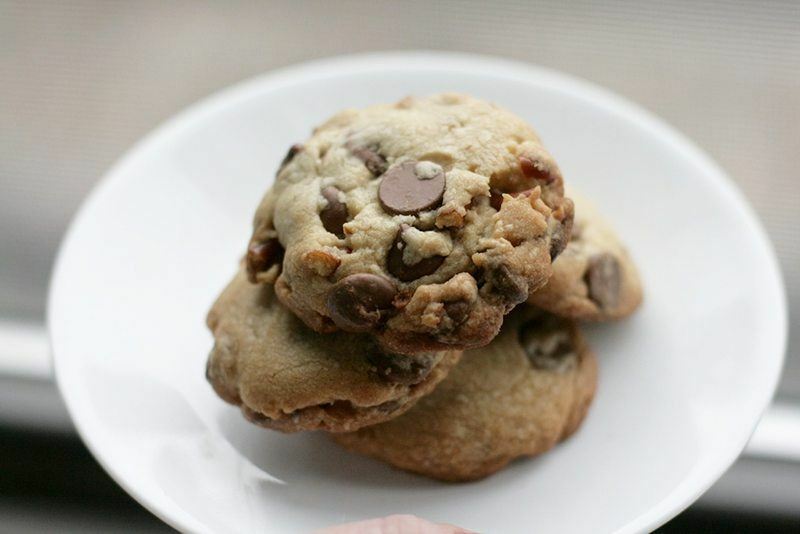 Featuring gluten-free oat flour along with chopped walnuts and a homemade walnut butter, these chocolate chip cookies are going to make any nut lover’s day. The wheat-free and whole-grain recipe is also vegan if you use dairy-free chocolate so be sure to shop according to your preferences. For the tropical dessert of your dreams, you’re going to need shredded coconut and coconut extract along with chocolate chips and a Bella Gluten-Free All-Purpose Baking Mix. For good measure, go ahead and toast some additional coconut flakes, which you can top your cookies with. 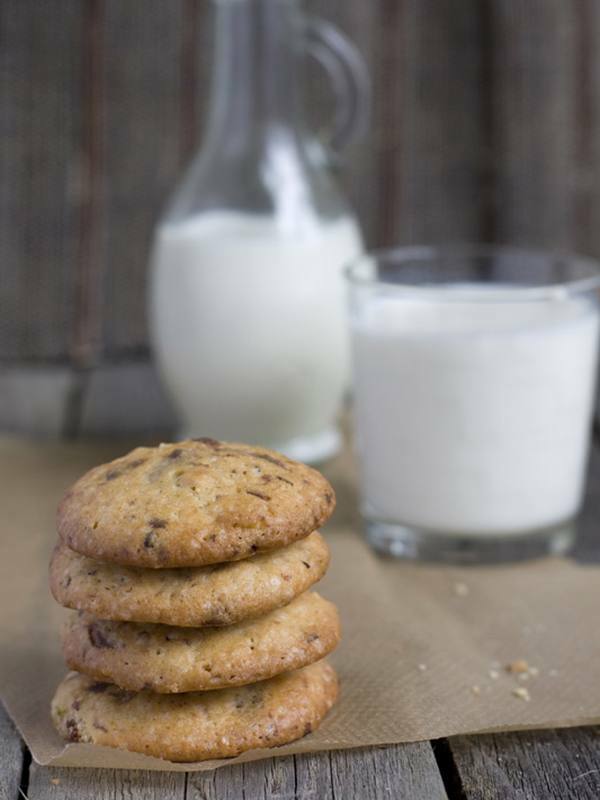 Along with a gluten-free baking flour mix from a brand like Bob's Red Mill or Cup4Cup, you can use mashed banana and grated zucchini to create an allergen-friendly cookie that’s also packed with nutrients. 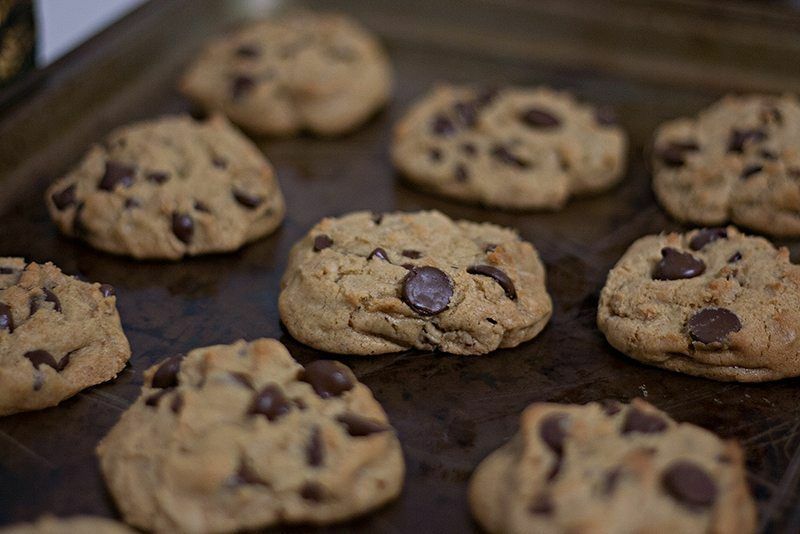 Once you add in semisweet chips and some oats, the taste and texture of your baked good will be perfect. 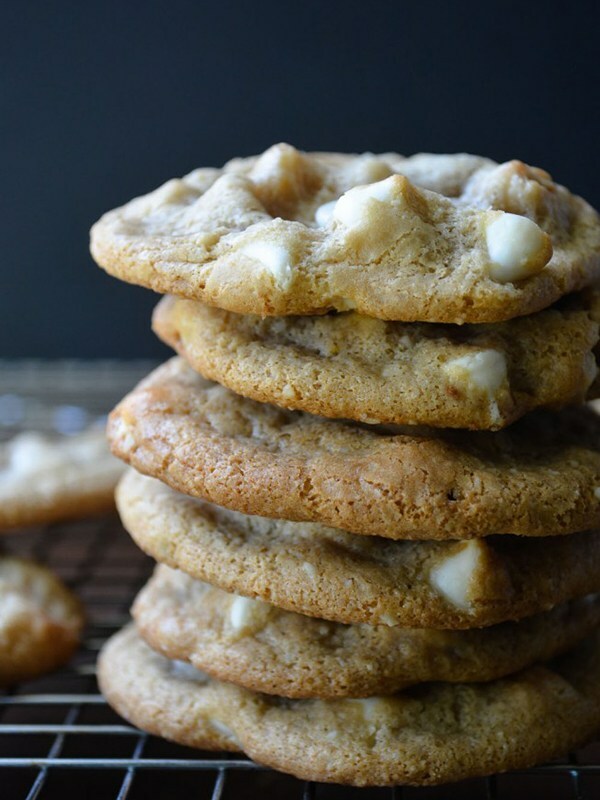 Although it may be hard to believe, you only need five ingredients to make a delicious macadamia chip cookie: brown sugar, white chocolate chips, baking soda, an egg and macadamia nuts. 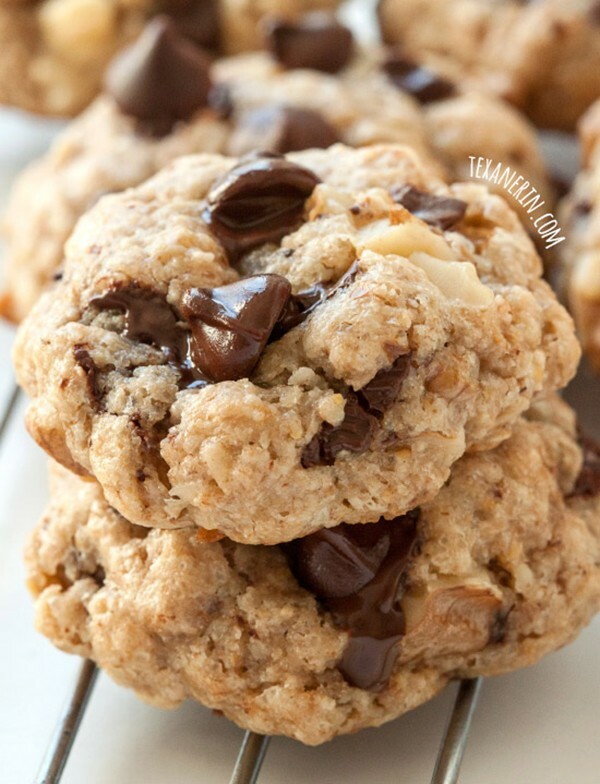 You can grind two cups of nuts into a smooth paste and then toss an extra half cup of chopped nuts into the cookie dough itself for a paradisaical treat with a crunch.